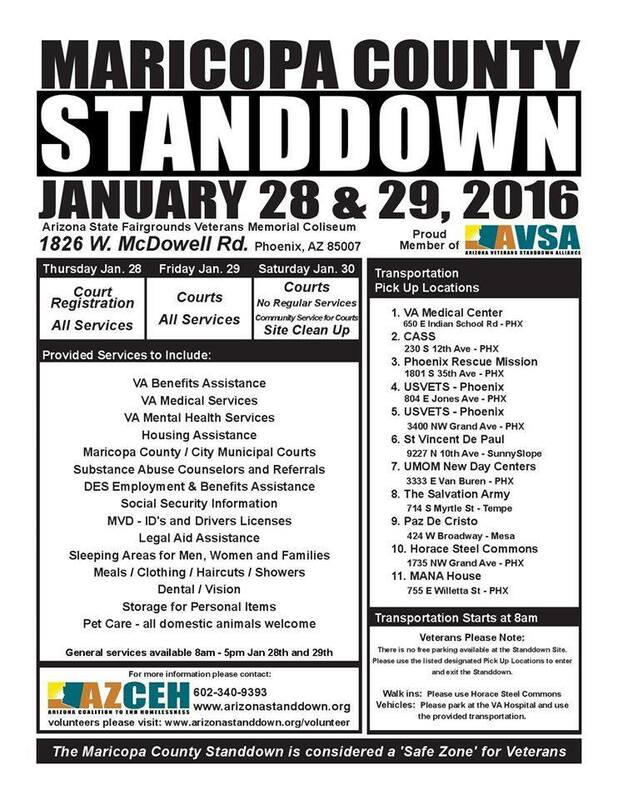 The 2016 Maricopa County StandDown for veterans will take place January 28-29. While the primary goal is to help homeless veterans access resources, including housing, its secondary goal is to bring community and service providers together in a collaborative format to build relationships throughout the year to benefit homeless and at risk veterans. We encourage you to attend if you need help as a veteran! We also encourage our community to volunteer time and resources to help improve the lives of veterans who are in need of these services. 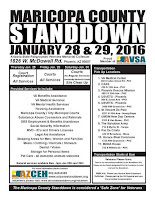 Please visit arizonastanddown.org for additional details about the event, donating and volunteering. The Arizona StandDown is an alliance of community-based organizations that come together to provide annual, one to three day events that bring together the State's homeless and at-risk military veterans, connecting them with services ranging from: VA HealthCare, Mental Health Services, Clothing, Meals, Emergency Shelter, Transitional and Permanent Housing, ID/ Drivers License's, Court Services and Legal Aidea, Showers and Haircuts and myriad other services and resources. Learn more at the Arizona Coalition to End Homelessness. 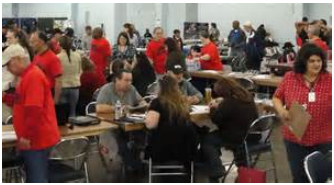 The February 2015 Maricopa County StandDown was the largest, singular outreach event for homeless veterans in the country.